Erkunden Sie Pisa, ohne sich auf einen Rundgang durch die Highlights der Stadt begeben zu müssen, vom Wunderplatz bis zur Kathedrale von Pisa. Neben der Navigation bietet Ihr Reiseführer auch wenig bekannte Fakten und Anekdoten über Pisas alte Geschichte. 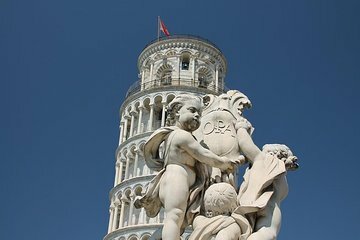 Genießen Sie den vorrangigen Zugang zum Schiefen Turm von Pisa mit einem Ticket ohne Anstehen, mit dem Sie an den langen Warteschlangen vorbeikommen können. We didn't read carefully enough what this tour entailed and had planned something else that overlapped it, so we had to cut the tour short a bit. But our guide, David, was very friendly and knowledgeable about Pisa. I learned so much in the short time we were with him. He was also very understanding of our mistake. I enjoyed the town of Pisa, it wasn't as crowded as some of the other places we had been. David sincerely wanted us to understand the history of Pisa. He was a delightful guide, it was very obvious he cared about the tourist and also loved his city, Pisa. Thank you David for a fabulous tour of Pisa! I would highly recommend this tour to everyone. Davids knowledge of Pisa is amazing. You see things you would never see by wandering around yourself. My son and I did this on our first day and it made us look at Pisa in a different light for the rest of our stay. From the beautiful architecture to the History of this once powerful maritime city. Pisa is famous for one thing, but the city is so much more than just the leaning tower, thought that is cool. We met our tour guide at the Central station and everything went as expected and we learned much, much more about this beautiful city. We did climb the tower and we got right to the front of the line. I liked this so much, I recommended to my cousins who took the same tour the following week. Definitely, one of the best experiences during our Italian visit. This was my absolute favorite tour from our 10 day trip to Italy. Our tour guide met us at the train station, and being a native of Pisa and a lover of his city, he led us on a fantastic meandering path towards the Leaning Tower, showing us so many intimate and fascinating details of the city. He had access to so many things we would have never had the opportunity to view, and he knew all the historical facts to make the trip interesting and captivating. I cannot recommend this tour highly enough if you only have a few hours and want to see as much of Pisa as possible. This tour made me fall in love with this enchanting little city, and I cannot wait to return! Great to have walked the parts of Pisa that we didn't get a chance to explore. His explanation on how the history of Pisa Tower building, how the efforts in stopping the decline, and the span of time to get the slanting corrected. Also, from different angle, we get to see that the Tower is not a straight tower even if it is upright. We ended up being the only two people on the tour. David was great as a tour guide. Being a Pisan, he took us to all the places in Pisa and even where the locals eat and shops. Great tour of the leaning tower and the surrounding buildings. Tower climbing was definitely an experience you won't want to miss! Skip the line is a must if you don't have time to wait. Diego was our tour guide, he is wonderful guy, cheerful, knowledgeable about the city and history of pisa tower. Went up the tower which is 245 steps, what I feeling reaching the top!